Preheat oven to 325 degrees F (165 degrees C). Grease an 8x12 inch baking dish. Bring a large pot of water to a boil. Remove tops and seeds from peppers. Blanch in boiling water 3 minutes. Drain on paper towels. Heat olive oil in a large, deep skillet over medium heat. Saute onion until translucent. Stir in garlic, and season with oregano, Creole seasoning and black pepper. Stir in shrimp and sausage, and cook until shrimp turns pink, 5 minutes. Stir in rice, and cook 1 minute. Pour in chicken broth and tomato sauce. Cook until thick, 15 to 20 minutes. Fill peppers with stuffing mixture, and place in baking dish. Bake in preheated oven for 15 to 20 minutes, or until heated through. Serve with lemon wedges and hot sauce. Tender sweet peppers stuffed full of flavor. Husband really enjoyed. I used chicken sausage and was concerned that the shrimp would be rubbery, but suprisingly enough they were fine, even the next day. These are absolutely delicious. I add melted cheese for a wonderful look and flavor. For the little effort these take to make, I give them two thumbs UP! Very fast and easy to make, being for Texas we like the kick from the peppers. Used chorizo, used cooked rice and omitted chicken broth and it was awesome!! Excellent. 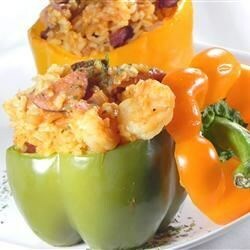 Used Creole seasoning blend from this site too, was very good. Cut peppers in half and then stuffed, personal preference, just find them easier to eat this way.